Next Level Acoustics Projection Screens support 4K and 8K resolutions. Next Level Acoustics Projection Screens offer an array of choices to meet a variety of system requirements, including CinemaScope and 4K compatibility. Starting with a line of speakers and audio accessories, the newly announced Next Level Acoustics Projection Screens line expands the company's offerings into the video category. 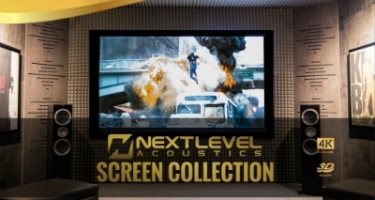 Next Level Acoustics' "Screen Collection" is designed to provide professional integrators with a choice of projection screens that offer a high "price and performance" ratio. The Massachusetts-based A/V manufacturer says the product line includes a range of materials such as matte white, acoustically transparent, and ambient light rejecting (ALR) capabilities. Next Level Acoustics says that its new products are available with .4-inch slim bezels, and integrators can specify the screens in either 1.78:1 widescreen or 2.35:1 CinemaScope aspect ratios. In addition, Next Level Acoustics says the projection screens come standard with LED lighting kits that include remotes.